Traditional Teepee Design and Function Meets Today’s Tent Technology. As you probably already know, camping in the outdoors, exposed to the elements can give you an appreciation for the simple things in life, like a warm, secure dwelling like a basic tent to harbor in when it’s raining or snowing. But even with this, you often yearn for a bit more, like being able to relax in your dwelling, with enough room to sprawl and dry yourself out next to a heat source or open flame. Often, I’ve dreamt of residing in a teepee or wigwam through a frigid storm, due to their ingenious design with the ability to have an open flame inside. Masterfully designed by Native Americans, Nordic cultures and other ancient civilizations, the Tentipi Adventure Nordic Teepee Tents (or tipi) represent the ultimate in Cool Camping Gear. Tentipi, based in Sweden, has taken the design of local ancient Nordic tipis, and combined it with today’s technology to create an amazing product. Tentipi Adventure Series Nordic tipis are lightweight, sturdy and weatherproof as is standard for modern, quality tents. What sets them apart is their ability to have a heat stove or open flame inside safely thanks to their Nordic tipi design roots and superb ventilation. Superb craftsmanship, safety and stability in wind are all vitally important when camping outdoorsexposed to the elements, and Tentipis are exactly the type of tent you can rely on for all of these. 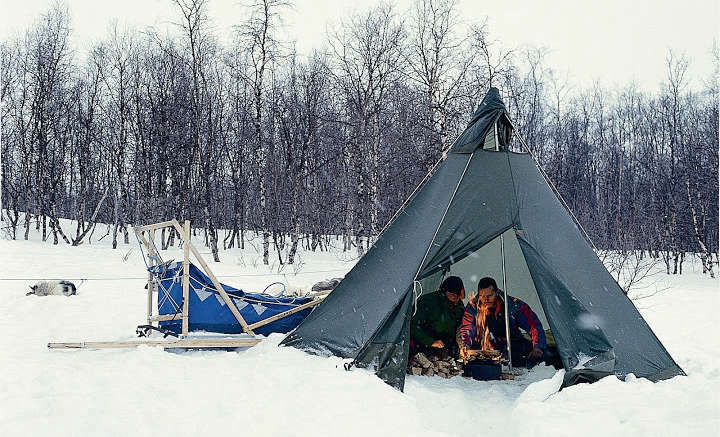 Be the first to comment on "Tentipi® Adventure Nordic Teepee Tents"